The focal segmental glomerulosclerosis (FSGS) market is highly competitive due to presence of numerous large players and presence of local players. 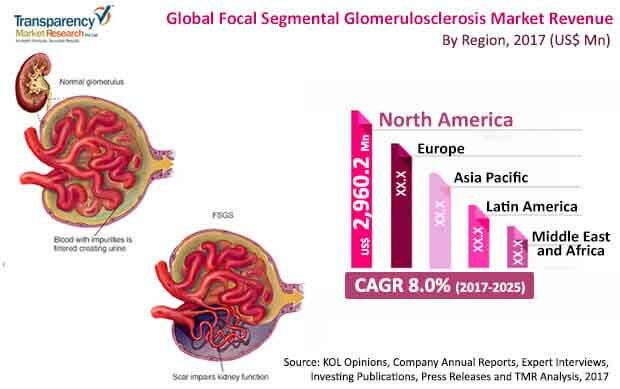 Some of the key participants in the global market for focal segmental glomerulosclerosis (FSGS) are Variant Pharmaceuticals, Inc., GlaxoSmithKline plc., Novartis AG, ChemoCentryx, Inc., and Retrophin, Inc. The global focal segmental glomerulosclerosis (FSGS) market will likely see continued changes in its contours with the successful launch of pipeline products in the next couple of years. As per a report by Transparency Market Research, the global focal segmental glomerulosclerosis (FSGS) market will likely rise at a solid 8.0% CAGR over the course of the forecast period from 2017 to 2025. Expanding at this pace, the market which was worth US$7.82 bn in 2016, is projected to attain a value of US$15.83 bn by 2025-end. Based upon the type of disease, the market can be bifurcated into primary focal segmental glomerulosclerosis and secondary focal segmental glomerulosclerosis. Between the two, the primary focal segmental glomerulosclerosis held a substantial 79.8% share in the market in 2016. Growing awareness about the disease and its management is at the forefront of driving growth in the segment. North America, of them, leads with a dominant share on the back of a properly structured healthcare industry and availability of reimbursement policies with wider coverage. Focal segmental glomerulosclerosis (FSGS) is a type of rare kidney disease that affects the kidney’s filtering system (glomeruli) resulting in proteinuria and serious scarring. Focal segmental glomerulosclerosis (FSGS) is usually fatal since it causes kidney failure within four to nine years followed by dialysis and then death. FSGS advances much more swiftly than diabetic nephropathy. Massive proteinuria, nephrotic syndrome, edema, hyperlipidemia, and hypoalbuminemia are some of the common symptoms of the disease. Risk factors include obesity, infection, sickle cell disease and reflux nephropathy. “Focal segmental glomerulosclerosis affects approximately 210,200 patients worldwide with 14,000 to 16,000 new cases every year. This has been a major growth driver in the market. Apart from the rising cases of the medical condition, other factors that can benefit the market are efforts by non-government organizations to increase awareness and increasing allocation towards research on rare diseases. NephCure Kidney International, The Kidney & Urology Foundation of America (KUFA), EURORDIS, and The National Organization for Rare Disorders (NORD) are some of the non-governmental organizations that are helping out patients with focal segmental glomerulosclerosis and generating awareness about the disease. Besides, research in the renal treatment field have resulted in several new drugs being developed and approved every year. Rising kidney transplants and dialysis procedures are other factors promoting the said market. As per the analyst, the market holds out a lot of opportunity due to a limited number of pipeline products at present.